Read On! 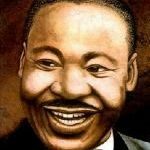 » Blog Archive » Martin Luther King, Jr. Sooner or later, all the people of the world will have to discover a way to live together. 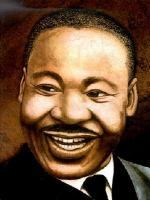 Growing up in Atlanta, GA, Martin Luther King, Jr. experienced the unfairness of segregation on a daily basis. When he saw “White Only” signs and he wasn’t able to attend a school with white children, his mother reminded him that he was as good as anyone else. He listened to his father’s words as the elder King preached in church every Sunday. During those formative years of his life, Martin understood how powerful words could be.